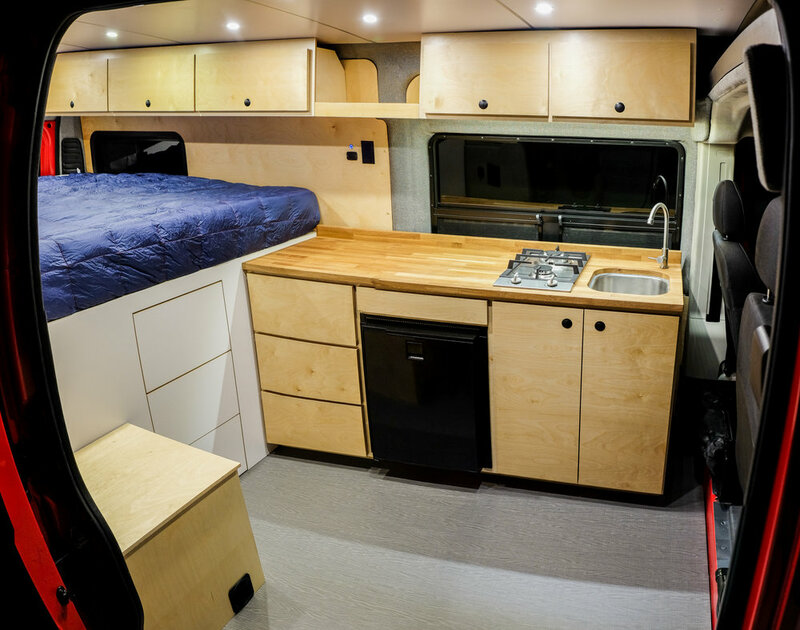 Rob approached us to build his perfect adventure van - a 159" Extended Promaster. The custom CNC cut formica walls and ceiling ensure that this sleek interior will withstand every type of climate and bumpy road. 320W of Go Power solar feeds 3 Battleborn lithium batteries to fuel a 4-zone dimmable LED lighting system, Isotherm refrigerator, remote controlled Maxxair fan, and all of Rob's personal gadgets. A 6" queen+ memory foam mattress sits on top of an elevated 36" bed platform. The elevated bed allows room for Rob's two mountain bikes to be safely stowed using the RockyMounts bike storage system. 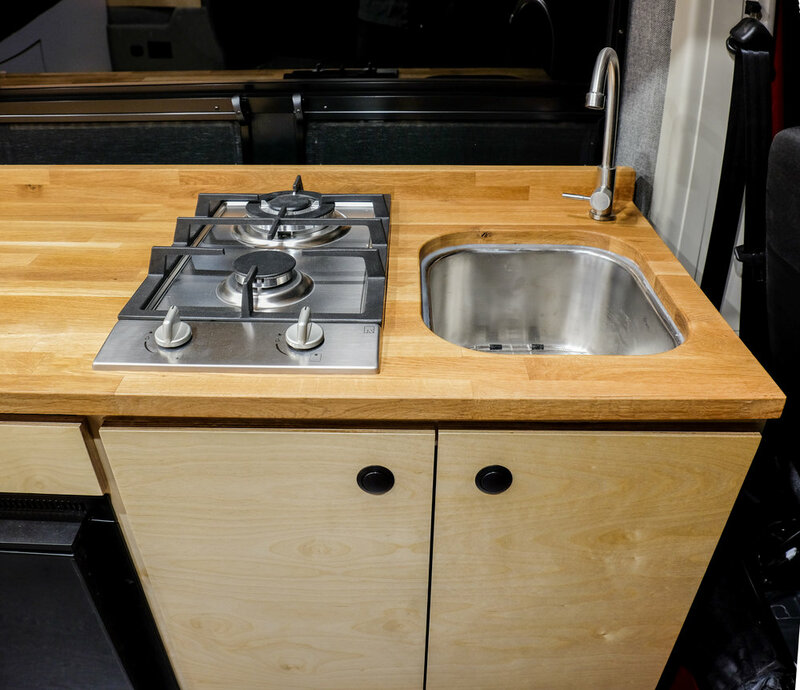 The custom CNC cut maple cabinetry was designed to withstand all of the moving and shaking that comes with life on the road. All cabinet doors and drawers have been fitted with touch-to-open hardware so they can stay securely closed on even the bumpiest of mountain roads. Under the kitchenette's oak butcher block countertop is a 7 gallon fresh-to-grey water system and an 11-lb propane tank. The propane fuels the two-burner cooktop as well as the rear-mounted shower system. Above the Isotherm refrigerator is a touch-to-open cutlery drawer. The dual vented window behind the kitchenette allows for some nice airflow (and a great view) while cooking. Rob can haul his canoe and all of his adventure gear on the roof's cross bar storage rack. The rear door mounted ladder makes sure all of his gear is accessible at a moment's notice. And an LED light bar was installed underneath the Fiamma awning so that the outdoor living space can be utilized at all hours. Stay up to date on our latest builds, and repost from our customers! Images may not be copied, printed or otherwise disseminated without express written permission of Dave in Action or its agents.